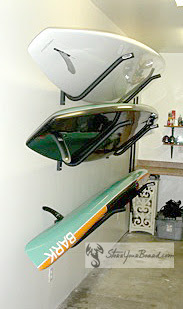 Check out how our customer stores their surfboards and bike with StoreYourBoard racks! As you can see this is a pretty small space but they did a great job of organizing and maximizing their space with these storage racks. To get 2 surfboards, 1 SUP, and 3 bikes all in this space is pretty impressive. If they weren't using these racks everything would probably just be laying against the wall in a big mess where you can't even get to your boards and bikes to use them. 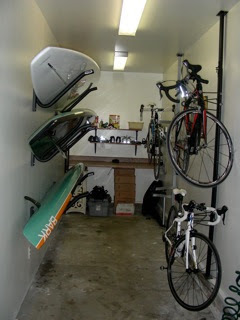 Do you wish your garage or storage area looked more organized like this? Get a storage rack from www.StoreYourBoard.com. Send us your pictures and we will post them and show everyone the way you organized your space.